$15.00 USD $10.00! Available as Downloadable PDF. Also available as a hardbound deluxe edition. 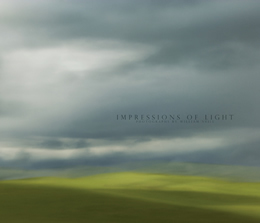 I am happy to announce the publication of my new ebook, Impressions of Light, in digital form. I have been working on this series since 2005, and it is rewarding to have finally produced a portfolio of my favorite images. The book was designed in Adobe InDesign with file sizes that have been optimized to preserve the high resolution images files. The quality of the images really comes to life on screen. I know that this isn’t the same tactile experience of holding a book in hand, but it’s hard to dismiss the vivid quality one can enjoy on screen. Impressions of Light - Digital Edition is delivered as two PDF files. One PDF contains single pages, and so is optimized for viewing the individual images, as well as for reading text. The second PDF shows the two-page spreads, allowing you to enjoy the book as it was originally designed. The ebook also offers interaction between each image and the Photo Notes section at the back of the book. Click on an image, and you are taken to the PDF page where the Photo Notes are for that photograph. When viewing the Photographic Notes, simply click on the photograph’s thumbnail, and you are linked back to that image in the PDF. At the back of my book, I have included a Photographic Notes section especially for photographers with technical info about the equipment I used, including camera, lens and exposure data. To purchase this Digital Edition book, just click on the "Buy Now" PayPal link below for a secure and easy e-shopping transaction, using either a PayPal account (if you have one) or a credit card if you prefer. Upon payment, you will return to a web page with downloading instructions.